BEAVERTON — They were already champions. Now, they've been honored again. 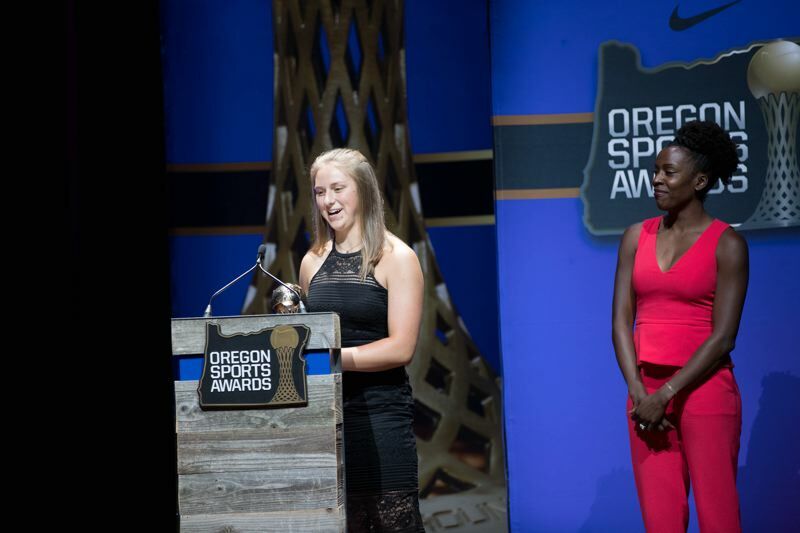 Sherwood High School senior Shelby Moran and Tigard High School sophomore Lizzy Stevens were among the winners at the 66th Oregon Sports Awards ceremony, presented by Nike. The event was held June 20 at the Stanford Theater in the Tiger Woods Center on the Nike World Headquarters. Moran was honored as the Female Prep Track and Field Athlete of the Year. And, for Moran, what a year it was. At the Class 6A state track and field championships, held in May at Hayward Field in Eugene, Moran won the title in the girls shot put competition with a mark of 42 feet, 11 inches. She also triumphed in the discus event, claiming a state title in that competition for the second time in three years, with a throw of 165-3. The week prior, at the Three Rivers League district track and field championships, held at George Fox University in Newberg, Moran set an all-time Oregon high school record in the discus with her winning throw of 179-7.5. Moran, who was also named the Gatorade Female Track and Field Athlete of the Year for the state of Oregon, will throw in college for Arizona State University. Sunset's Kelly Makin and Catlin Gabel's Maya Rayle were the other finalists for the Female Prep Track and Field Athlete of the Year honor. 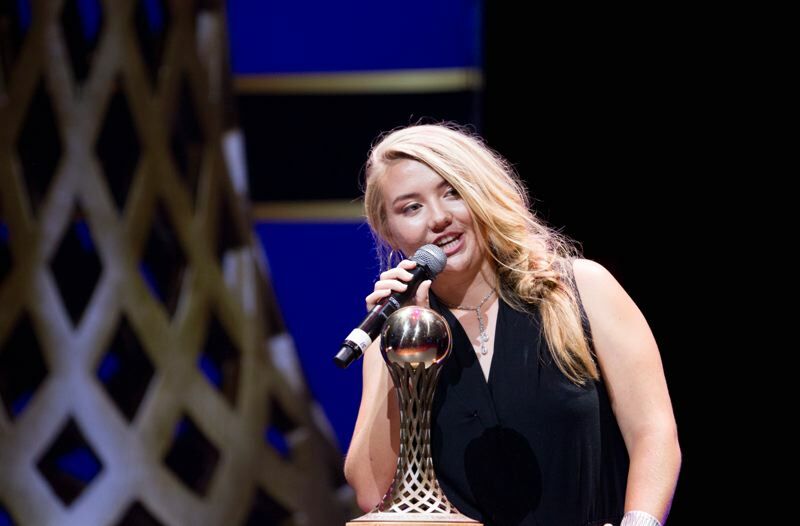 Stevens was honored as the Female Prep Tennis Player of the Year at the Oregon Sports Awards for the second straight year. And, for the second straight year, Stevens won the girls singles competition at the Class 6A state tennis tournament, held in May at the Babette Hornstein Tennis Center in Beaverton. Stevens first breezed through the Three Rivers League district tennis tournament, going 5-0 at the event, losing a total of just three games. Stevens, the No. 1 seed, then won all four of her matches at the Class 6A state tournament, including a 6-2, 6-0 victory over Jesuit sophomore Farida Abdelmoneum in the championship match. Anna Kearn of Corvallis and Abdelmoneum were the other Female Prep Tennis Player of the Year finalists. Tigard High School senior Braden Lenzy was a finalist for the Prep Football Player of the Year honor. That award went to Talanoa Hufanga of Crescent Valley. Lenzy also was a finalist for the 5A-6A Johnny Carpenter Award, as the top Male Athlete of the Year. That honor also went to Hufanga. Adley Rutschman, a 2016 Sherwood High School graduate, and sophomore catcher for the Oregon State University baseball team, was a finalist for the Bill Hayward Amateur Athlete of the Year honor. That award ended up going to Norman Xiong of the University of Oregon and Rutschman's Beaver baseball teammate Nick Madrigal. Former Westside Christian standout Chloe Brown, who played her senior year at Southridge, was named the Prep Volleyball Player of the Year. Makin and Southridge's Cameron Brink were the 5A-6A Johnny Carpenter Award winners, as the top Female Athletes of the Year.